The USS HARRY E. YARNELL (CG-17), a Leahy class cruiser, was commissioned on 2 FEB 1963. 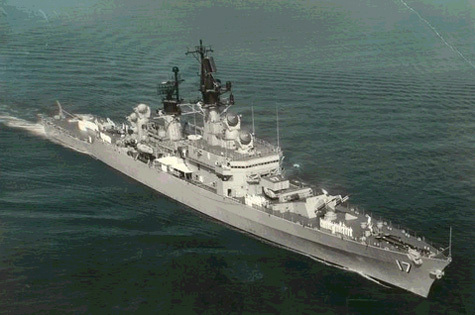 USS HARRY E. YARNELL served her country for 30 years, 8 months and 18 days, until decommissioned on 20 OCT 1993. DEC 1996 - DEC 1996 Scrapping contract cancled towed to Philadelphia for storage. Harry E. Yarnell was launched 9 December 1961 by the Bath Iron Works, Bath, Maine; sponsored by Mrs. PhilipYarnell, wife of the late Admiral Tarnell; and commissioned 2 February 1963 at the Boston Naval Shipyard, Captain Charles E. Nelson in command. Second of the "double-end," Leahy-class guided-missile frigates to join America's sea-going arsenal, Harry E. Yarnell is equipped with Terrier surface-to-air missile launching tubes both fore and aft and ASROC anti-submarine missiles as well as more conventional torpedo tubes and guns. Before taking her place in America's powerful deterrent force, the new ship was fitted out at Boston and received a grim reminder that even in peacetime the sea can be a powerful enemy. As she was out on trials, Harry E. Yarnell was diverted 10 April 1963 to search for Thresher, the nuclear submarine later found on the bottom some 8,000 feet down. Quartering the area where the sub was last reported, the guided missile frigate found an oil slick and some debris but could not contact the lost submarine. On her way to her new home base at Norfolk 23 April, Harry E. Yarnell passed and photographed several Russian ''merchant" ships. The next few months were spent conducting training for shakedown and missile qualification. Designated to carry out standardization trials for her claiss as well as special acoustical tests, Harry E. Yarnell spent 28 October-26 November in the Caribbean operating out of Guantanamo and then returned to Norfolk. Harry E. Yarnell continued operating in the Virginia Capes area and the Caribbean until departing Norfolk 8 September 1964 for her first Atlantic crossing. NATO ASW exercises en route took the guided missile frigate far north, and she crossed the Arctic circle on the 21st. She visited Amsterdam en route to the Mediterranean, where she remained until returning to Norfolk in February 1965. On her next Mediterranean deployment, which began 8 October, she transited the Dardanelles 3 January 1966 and entered the Black Sea to operate close to the Soviet Union before returning to Norfolk in March. After NATO exercises in the North Atlantic, Harry E. Yarnell received the battle efficiency "E" for the preceeding year. Operations in the Gulf of Mexico and Caribbean brought the fine ship and her crew to a high degree of readiness before she sailed for her 3d Med deployment early in 1967. She cruised the Mediterranean ready to help snuff out trouble, should it occur in that troubled area, until returning to Norfolk in May. At mid-year she operated in the North Atlantic, honing her fighting edge to prepare for the challenges of the future.